Despite the fact that Japanese Finance Minister Kaoru Yosano said Friday that February's fall in the so called "core-core" consumer price index doesn't mean Japan is back in deflation, few are ready to accept his judgement. Data released on Friday showed a 0.1% on-year fall in the core-core index (that is the basic index with food and energy stripped out), while the core consumer price index (which only excludes food) was flat from a year earlier. The preoccupying inflation news came on the same day we learnt that retail sales had retreated in February by the biggest margin in seven years in February, as growing concerns about jobs and wages had an obvious impact on Japanese shopping habits. 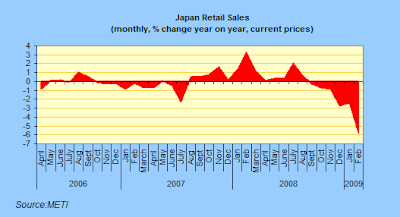 Retail sales were down 5.8 percent from a year earlier (to 9.98 billion yen) — the sharpest decline since February 2002. The figure marks the sixth straight month that sales have fallen at retail outlets like department stores and supermarkets. Business at department stores, which tend to reflect spending on luxury goods and premium items, was especially bleak in February, with sales down 11.5 percent from a year earlier. 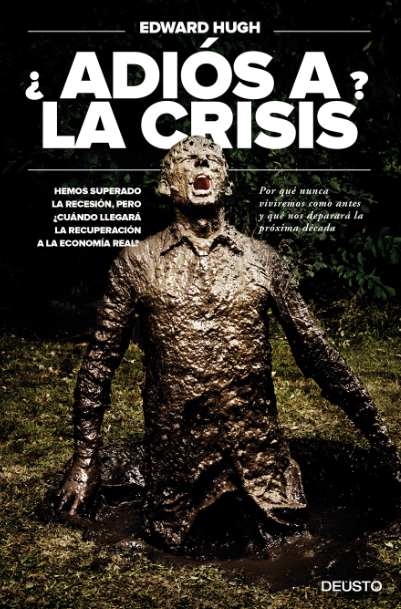 And the reason why prices are falling, and workers are fearful for their jobs? 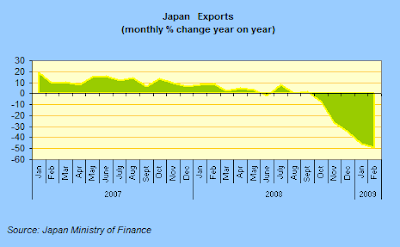 Well just look at the export numbers : Japan’s exports plunged a record 49.4 percent in February as deepening recessions elsewhere hit demand for Japanese products. 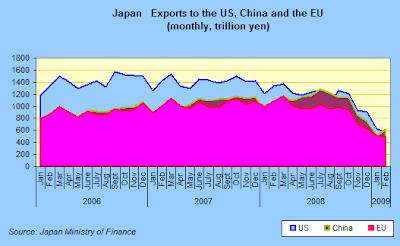 Shipments to the U.S., which is still Japan’s biggest market, tumbled an unprecedented 58.4 percent from a year earlier, with automobile exports down a horrific 70.9 percent. So the massive contraction in industrial output that this decline in export business is producing is sending shock waves through the economy, and it is the pressure form all the excess capacity that is now forcing prices downwards. Nowhere is the process clearer in land and property values, long the key driver of the deflation process in Japan - and we learnt only this week that Japanese residential land prices fell 3.2 percent to a 24-year low last year - their lowest level since 1984. Overall property prices declined 3.5 percent, wiping out completely the recent two years of gain that followed the earlier 15-year slump. And the decline in residential land values, which are about half of what they were at the height of the bubble in 1991, only looks set to continue as the recession deepens. So in property market terms at least, it isn't the lost decade anymore, we're now moving into the "lost quarter century".